Snippets of Jack: "With Your Permission, Your Heinie"
"With Your Permission, Your Heinie"
After arriving in the king's palace, Jack is litterally dragged by the guards to a meeting with King George II. They take him to the dining room and chain him to the chair. Then they leave him all alone in a room full of food: bad decision. Jack gets a little hungry and can't stop admiring the cream puff in front of him. With his hands still chained down, he finds a way to move his chair closer to the table. But he runs out of time and the king and his men come in. Desparately, Jack bumps the table so the cream puff falls off and then kicks it upward, where it is nicely perched on the chandelier. So much for that. For now. The very attractive king takes his seat and the other men crowd around him to interrogate Jack. There's a super awkward silenec, which is broken by one of the men to the left of the king: "You are Jack Sparrow?" Jack: "There should be a captain in there somewhere." You really can't forget that. King: "I've heard of you. And you know who I am." Jack: "Face is familiar. Have I threatened you before?" Man: "You are in the presence of George Augustus, Duke of Brunswick-Luneburg, Archtreasure and Prince-elector of the Holy Roman Empire, King of Great Britain and Ireland, and of you." Wow. Try saying that one five times quickly. Jack: "Doesn't ring a bell." King: "I am informed you have come to London to procure a crew for your ship." Jack: "Vicious rumor. Not true." Uh-oh. Identification crisis. King: "Then you lied to me when you told me you were Jack Sparrow." 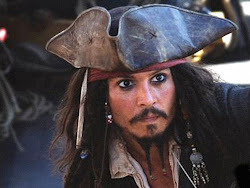 Jack: "I am Jack Sparrow, but I'm not here to procure a crew. That is . . . Someone else." Jack starts to move his arms around, clanging the chains about. King: "Ah. Someone else named Jack Sparrow. You've brought me the wrong wastrel. Find the proper one and dispose of this impostor." You really must hold onto your name tighly in England. Jack makes more noice with his chains to get their attention. Jack: "No, wait, wait, wait. Hang on a minute. I'm Jack Sparrow, the one and only. And I am in London." Thank you for clearing that up, we can see you. King: "To procure a crew. To undertake a voyage to the fountain." Jack doesn't here any of this as he is being extra obnoxious with his chains. Jack: "What?" The king gets rather tired of being interrupted. King: "Will someone please remove these infernal chains?" Jack agrees: "Come, come." Man: "We know you're in posession of a map." Other man: "So confiscate the map, and to ghe gallows with him!" That's rude. Take his stuff and hang him??? King: "Have you a map?" Jack reaches into his JACKet to get the maps out, but feels nothing. Awkward. Jack: "No." Man: "Where is it?" Jack: "The truth? I lost it. Quite recently, in fact." King: "I have a report. The Spanish have located the Fountain of Youth. I will not have some melancholy Spanish monarch, a Catholic, gain eternal life." Excsue me! As Catholics, they've already got eternal life. Jack just walks around nibbling on food as the king bangs angrily on the table. Man: "You do know the way to the Fountain?" Jack: "Of course I do. Look at me." Gladly. Other man: "You could guide an expedition." Jack likes the sound of this. Jack: "Wtih your permission, your heinie, you will be providing, then, a ship . . . and a crew?" King: "And a captian." Party's over. Especially when Jack realizes that this "captain" is none other than Barbossa, his good old friend. This wouldn't be the first time Barbossa has stolen captaincy from Jack. But things get better when Barbossa shares that the Black Pearl has been stolen. Barbossa happens to almost look as attractive as King George II. King: "Captain Barbossa, each second we tally, the Spanish out distance us. I have every confidence you will prevail and be rewarded with the high station you so desire." Barbossa: "To serve doth suffice, sire." What a kiss-up. And now he's talking like Shakespear. Jack agrees with me. Jack: "You, sire, have stooped." Barbossa: "Jack, our sands be all but run. Where's the harm in joining the winnig side? And you do meet a nice class of person." Jack: "I understand evertying. Except that wig." With that, Jack ditches his two guards, makes their guns shoot upward at the chandelier, climbs onto the table, stomps on perfectly good food, and breaks open a window. But he's still missing the cream puff. So he uses the curtain to grab hold of the chandelier as it wobbles back and forth. Finally, he has the cream puff so he runs away through the upper hallway. King: "He escaped?" Barbossa: "Leave it to me, sire." The king is so pleased by this he makes a very stunning happy face that is probably as gorgeous as Medusa's.